Spring in the south is truly the best time of the year. The weather is about as close to perfect as it can get. With the low humidity and few mosquitos, no one needs an excuse to spend time outside. Spring in the south also means it’s festival time with festivals lining our calendar almost every weekend and, most importantly, springtime also means it’s crawfish season. Typically crawfish season runs from March to mid-June and although crawfish are really “in season” year round, the big crawfish are usually found this time of the year and the prices are the best. This season, however the crawfish are smaller. The icy cold temperatures in and around the gulf this year has resulted in smaller than normal crawfish at the beginning of the season. With the warmer weather starting, they will definitely get bigger. Growing up in Louisiana, we had crawfish boils often and it was always a good time. Huge pots of water heated by propane flames decorated the yard, cold Abita beer flowed freely and music from Dr. John always played in the background. We didn’t think life could get any better. We lined picnic tables with newspaper and piled huge mounds of spicy seasoned crawfish on top. Scattered throughout the crawfish were hot and flavorful cooked corn on the cob and spicy red potatoes that were cooked along with the crawfish. And messy…talk about messy, but in a really good way. The juice from the cooked crawfish would totally be dripping down our arms as we pinched the tails and sucked the heads. Sounds wierd, I know. But if you’re from the area, you get it. Although I haven’t bought any live crawfish yet this season – emphasis on the “yet” – I will soon, March and April every year seem to call out for me to break out my crawfish recipes and start cooking. May I present, Crawfish Beignets. Beignets are fluffy pastries reminiscent of a “fritter”, fried and often coated with powdered sugar. They’re popular in New Orleans and a must order item at the famous Cafe du Monde in the Quarter. The Crawfish Beignets I made aren’t dusted with powdered sugar, they’re not a dessert. They’re more of an appetizer or a snack or heck, the main course even. Dip them in a spicy Remoulade Sauce and your tastebuds are in heaven. And a word of warning. You CANNOT eat just one. Period. I usually use frozen crawfish for this recipe simply because it’s easier. I don’t have to fuss with cooking and peeling the crawfish. I just thaw it and mix it in. Remoulade Sauce is a classic french sauce and is often mayonnaise based. The general ingredients include of course, mayonnaise, chopped onions, garlic and parsley, creole mustard and spices. There are many variations to this recipe since many folks make it the way they like it. It’s wonderful served with seafood, as a dipping sauce for french fries, spread on po-boys and even on grilled chicken. It’s very easy to make and keeps well in the fridge. 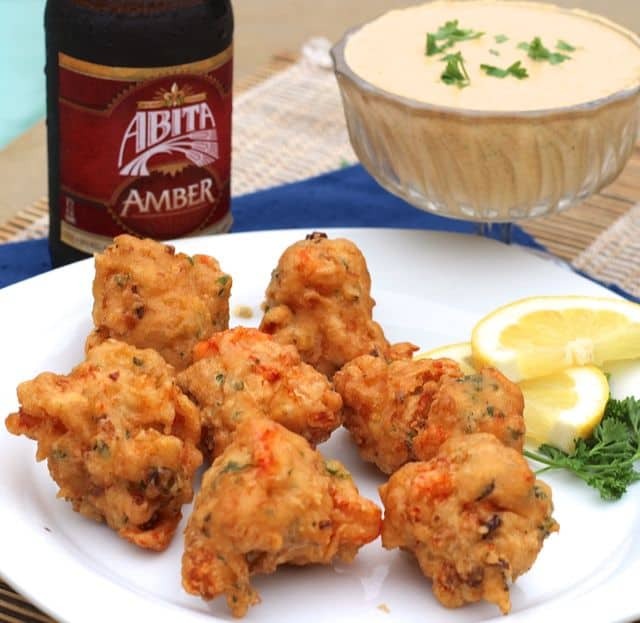 You’ll be surprised at how easy it is to make Crawfish Beignets. First, combine flour, baking powder, creole seasoning such as Zatarain’s or any other brand and ginger in a bowl. Stir in garlic, crawfish, chopped parsley, green onion, salt, Tabasco sauce and enough water to make a soft dough. Heat oil to 350 degrees in a heavy deep saucepan. Drop in teaspoons of dough and fry until golden brown. Remove with a slotted spoon to paper towels to drain and serve drizzled with Remoulade Sauce. What do you think? Are you ready for some crawfish now? Combine the flour, baking powder, creole seasoning and ginger in a large bowl. Stir in the garlic, crawfish, green onions, parsley and salt. Stir in the Tabasco sauce and enough of the water to make a soft dough. Let dough stand for 10 minutes. Heat the oil to 350 degrees in a heavy deep saucepan. Drop in teaspoonfuls of dough and fry until golden brown. Combine all the ingredients in the bowl of a food processor and process for 30 seconds. Use immediately or store. Will keep for several days in an airtight container in the refrigerator. These bring back good memories of Mardi Gras in Port Arthur Joanie! They look delicious! I agree with you…..I will not just be able to have one of these!! These are added to my Super-Bowl appetizer list! I think they are really going to be a hit! So glad I found this today. I want these right now! My family would go gaga for these beignets with remoulade. I am always a remoulade fan. Wish I could reach through the screen and grab one. These look insanely delicious! All my favorite flavors! These are the best things I’ve seen all day. I am DYING to make them. I went to college at Tulane and I fell in love with eating crawfish. These crawfish beignets look incredible!